The first time I needed a stitch marker I didn't know beaded beauties existed (I was a teenager at that time and it was, well, quite a few years ago :-)). So I just made a loop with some leftover yarn and used it for quite a long time. When I eventually saw how beautiful beaded stitch markers look, I was hooked. Experimenting with beads, wires, cords, color and shape has become one of my hobbies ever since. 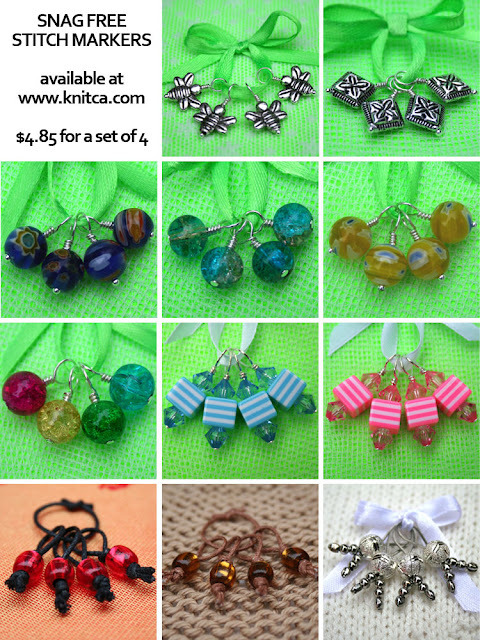 Now I have more stitch markers than I can possibly ever use and today I uploaded them to my brand new Etsy shop! And to my website, of course.